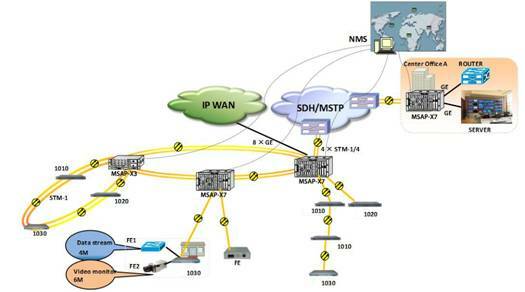 MSAP-X7 is the centralized Multi-Service Access Platform (MSAP) compatible with ITU-T standard. It is designed as a cost-effective and flexible multi-service platform, with STM-1 / STM-4/STM-16 level uplink ports and abundant optional downlink cards to provide typical E1 traffic, PCM, optical tributary, EoSDH and EoPDH traffic access and aggregate. As an important feature, in MSAP-X7, the dual SDH uplink modules and dual Ethernet uplink modules can work simultaneously. Between each SDH uplink module and each sub-slot, there are STM-1 LVDS connections, and similarly, between each Ethernet uplink module and each sub-slot, there are LVDS Gigabit Ethernet connections. With this backplane design, TDM traffic in SDH/MSTP network and packet traffic in IP network can be distributed and aggregated in MSAP-X7. A powerful timeslot cross-connection and IP data switching facility is supplied in MSAP-X7. With the ability of connecting various network topologies, reliable self-healing mechanism, and unified intelligent management system, it is suitable for enterprise access, private network interconnection, mobile base stations connection and video monitoring applications. ü 7U height, 19 Inch width standard, 16 card slots. ü LVDS clock-free backplane, independent SDH bus and GE bus architecture. ü Dual SDH uplink, dual Ethernet uplink and dual management units architecture ensure the system reliability. ü Up to 4× STM-1/STM-4/STM-16 interfaces . ü LC type SFP module, hot-pluggable. ü 98VC4×98VC4, or 96TU-3×96TU-3, 2016VC12×2016VC12 non-blocking cross-connection. ü 1+1 line card protection to realize clock module hot-backup. ü 1+1 linear unidirectional/ bidirectional Multiplex Section protection (MSP) and SNCP protection. ü Point-to-point, chain, ring and tangent ring network topology. ü Up to 4 GE optical ports and 4 GE electrical ports. ü Each card can aggregate the 1000M Ethernet traffic from up to 8 downlink cards, up to the 128 VCGs can be aggregated to the GE/GX port. ü Diversified downlink cards include optical downlink, E1, PCM and Ethernet downlink cards. ü Communication with the remote Ethernet media converter, SDH,PCM and MSTP terminals. ü Supports 1+1 path protection. ü Supports the embedded E1 BERT testing function. ü Traces any timing source of STM-1/4/16 uplinks or STM-1 optical tributaries, or external timing source. ü Supports External timing output. ü The timing source can be switched manually or automatically. ü Supports free-running, tracing and hold-over modes. ü Supports ZSView network management platform based on C/S architecture. ü Supports DCC and EXM (Extended E1 interface for management) channel for communication between gateway and elements. ü Supports DCN channel for the communication between gateway and server. 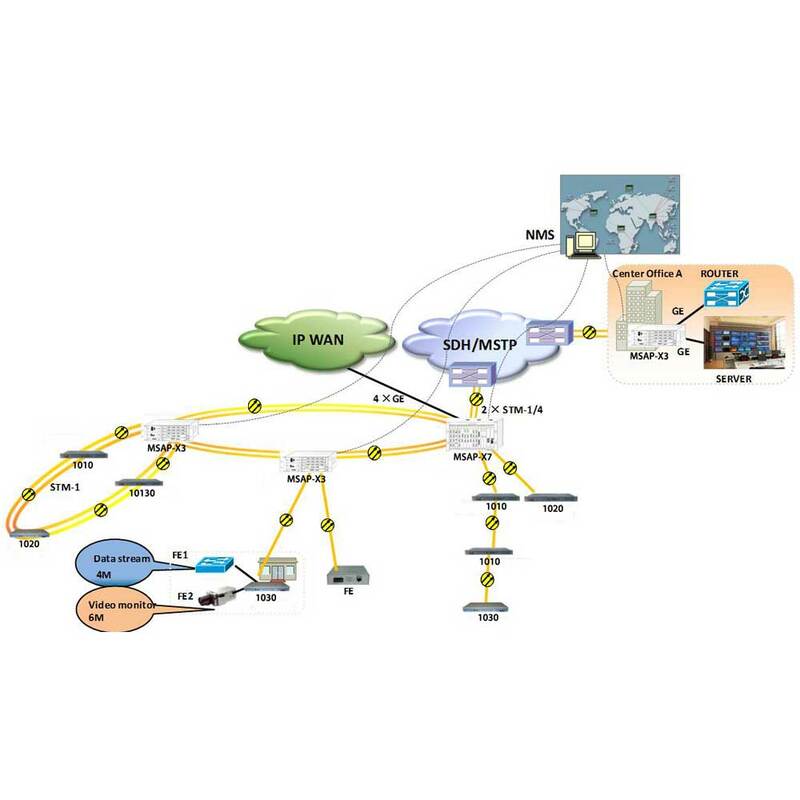 ü Supports SNMP_V1 and SNMP_V2 protocol. ü Supports local and remote firmware online update without disturbing existing traffic. ü Provides top-mounted aural-visual alarm output. 2×GX+2×GE, supports port-based VLAN and 802.1QVLAN, and trunk function. Aggregates the Giga Ethernet traffic from 8 slots at most. 16 E1, 75Ω and 120Ω selectable. 32 E1, 75Ω and 120Ω selectable. Full , cross-connection among thirty 64Kb/s timeslot of 64E1, with the capacity of 1920*1920 64Kb/s. 8 PCM sub-module slots, up to 30 FXS/FXO/magneto voice channels or 16 2/4 wire E&M audio or 16 RS232/RS485/64K data interfaces totally. 8 PCM modules, up to 30 FXS/FXO/magneto voice channels or 16 2/4 wire E&M audio or 16 RS232/RS485/64K data interfaces totally. 8×STM-1, DXC, supports P2P, P2MP, chain and ring topology. 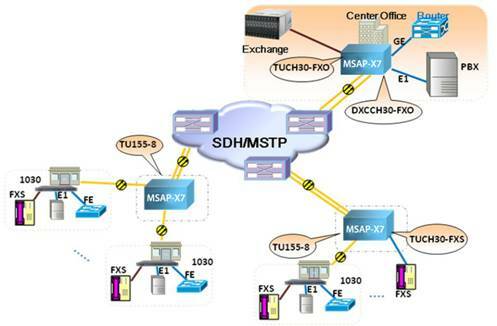 4×STM-1, DXC, supports P2P, P2MP, chain and ring topology. 4×PDH optical interface, DXC, used to connect remote PDH equipment, supports point-to-point and star-type network. 8×PDH optical interface, DXC, used to connect remote PDH equipment, supports point-to-point and star-type network. 2×GE+2×OPT(1.25Gb/s), achieve 16 E1 and 2 gigabit Ethernet data transmission over optical line of 1.25Gb/s. Multiple 1GE&16E1 mixed traffic optical rings to enhance the traffic protection ability of the entire system. 8×FX, 8 physical isolated VCG, with EoSDH, GFP/LCAS/VCAT, flow control, TS1000 protocol. 4×FX，4 physical isolated VCG, with EoSDH, GFP/LCAS/VCAT, flow control, TS1000 protocol. 8×FE, 8 physical isolated VCG with EoSDH, GFP/LCAS/VCAT, and flow control. With Ethernet switch, 8 Ethernet can also be aggregated to Giga Ethernet without EoSDH. Port-based VLAN and 802.1Q VLAN, QinQ. With Ethernet switch, 4 Ethernet can also be aggregated to Giga Ethernet without EoSDH. 1 ×COMBO + 1 × GE + 1 × FE, 16VCG, EoSDH, GFP/LCAS/VCAT. With Ethernet switch, the Ethernet can also be aggregated to Giga Ethernet without EoSDH. 2×GE, EoS, 2VCG, up to 63 VC12 for each VCG. 8×FX, port-based VLAN , 802.1Q VLAN, QinQ, TS1000 protocol. Achieve Ethernet aggregation from 8 remote Ethernet Media Converters. 4×FX, port-based VLAN , 802.1Q VLAN, QinQ, TS1000 protocol. Achieve Ethernet aggregation from 4 remote Ethernet Media Converters. 1×COMBO +1×GE+1×FE. 16VCG, EoPDH, LCAS/VCAT. Port-based VLAN and 802.1Q VLAN, QinQ. Supports GFP for multiple E1, and GFP/HDLC for single E1. Real time SNMP based management unit, supports hot-backup and cascading connection applications. Redundant-backup Power modules, with the power consumption of 300W, supports management function, such as power input/output alarm indication. Redundant-backup Power modules, with the power consumption of 200W, supports management function, such as power input/output alarm indication. Fan enable/disable and temperature threshold configurable, supports temperature display real time and fan alarm monitor. Provides a 4ch FXO interface, connects to PBX user interface. Works with PCM-4FXS module to achieve extension of PBX user line. Provides a 4ch magneto telephone interface, adopts 2100Hz inband signaling with signaling transmission and detection function, mainly apply to order wire, private line etc,. Occasions. Provides 2ch 2/4 wire E&M audio without signaling, supports 2/4 Wire mode online switch. 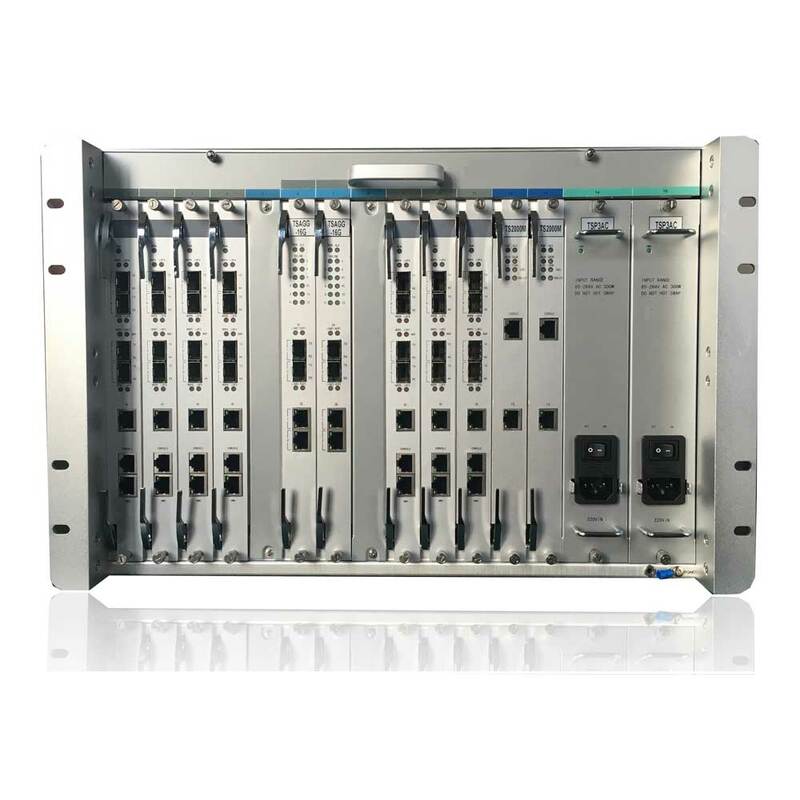 Provides a 2ch RS232 asynchronous interface, each channel occupies one 64K time slot. Supports rate from 0Kbps～19.2Kbps. Provides a 2ch RS485 asynchronism interface, each channel occupies one 64K time slot. Supports rate from 0Kbps～19.2Kbps, half-duplex mode.